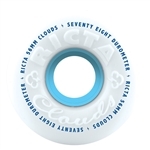 Red Core Ricta wheels have a slightly tougher surface 86A and they are lightweight with a harder inner core to hold the bearings. These clouds will slide if you aren't too big. Customer Rating - 5 stars - Like Riding on Butter! Love these wheels! They are soft and smooth like butter.